Thermal Earth are more than just a training provider. One of Thermal Earth’s strengths is providing installers with all the products they need to complete a successful renewable installation, everything from the Heat Pump to the ground source manifold, wood boiler to twin wall flue. Thermal Earth work with a number of manufacturers and have created tailored packages for Heat Pumps, Biomass Systems and Thermal Systems and Underfloor Heating. With discount structures in place across the product range, as an installer you can rest assured you are getting quality products at the best price. Thermal Earth’s technical department have excellent product knowledge whom you can rely on should you have a query about the product or installation you are undertaking. Fitting a range of products from an assortment of different manufacturers can often seem like a daunting experience. 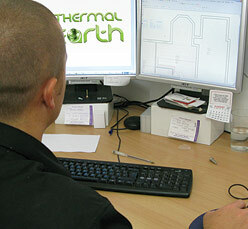 At Thermal Earth we carefully design our installation packages to ensure installations go as smoothly as possible. We back this up by offering technical support through our in house technical team. Technical support can be performed by phone, e-mail or on site visits. Having in house electrical engineers and heating engineers with in depth knowledge of renewable installations in both commercial and domestic areas allows Thermal Earth to offer unparalleled technical support. Coupled with the design service and product choice, you only need to come to one company…Thermal Earth! Along with the technical support offered by our team, we also offer a design and specification service. Providing we are supplied with a set of plans and SAP calculations. Thermal Earth will carry out a Heat Load assessment of the building to ensure that the system design will meet the demands of the property owner. Having this bespoke system design service at your disposal means that the property owner can rest assured that they are not only getting a high standard in terms of installation work, but also the most efficient system through careful consideration at the design stage. Thermal Earth can provide system layouts of the heating system and underfloor heating layouts ensuring your installation goes as smooth as possible. 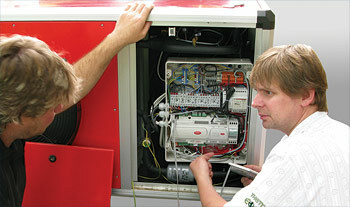 Alternatively there are a number of pre-designed packages to suit a variety of installations. These can be referenced easily so that you can prepare your quotations quickly and efficiently. 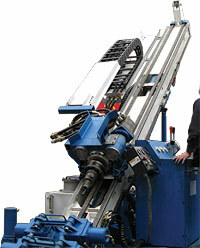 We have our own dedicated drilling teams to enable us to carry out all relevant drilling works. Our drilling teams are available for contract work on projects of all sizes. We believe having our drilling service at your disposal enables you to offer a significant advantage over your competitors.